SCP | CCIE or Null! Well, I just realized the SolarWinds certification test was available free of charge so the other day I decided to give it a shot, I figured it would be a nice small break from my CCIE studies. I never thought I would bother getting a certification for a management platform but considering I’ve been working with it for years, I figured why not. 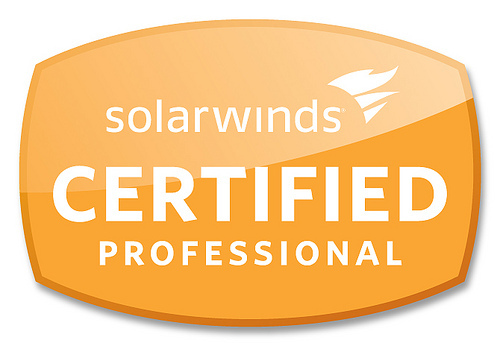 I’ve been working with SolarWinds hands-on for a least 5 years now. I’ve done at least 3-4 installations from the ground-up. Not just install and hit next, planning out and designing the system to manage a few thousand nodes. Created countless user accounts, custom dashboards, custom reports, customer pollers, views, limitations, and so forth. Free of charge (for now). It’s online, meaning you can take this from the comfort of your couch. Around 80 or so questions. So it’s not that short. Now, for my thoughts on the exam. All around the exam was not that bad, for as long as I have been a network engineer and as long as I have worked with SolarWinds there were a few questions that had me stumped, which honestly surprised me I didn’t think I was going to miss 10-12 questions so it just goes to show you, even though the test is about a management platform or the fact it is free it is not what I would call a push-over. Now don’t get me wrong there were some question and some answer choices that were just gimmes, but usually you can find a few of those on every test. Now since the test is online and you do not have to go into a testing center it is considered ‘open book’ meaning you can have the test open in one window and the admin guide open in another window, which may hurt the value of the exam. As far as myself I didn’t even bother putting forth the effort to read the admin guide (again), I figure if I couldn’t pass the exam with my SolarWinds experience either there is something wrong me or the exam. Now I’d venture to say this exam is a good measure for those that have been doing network administration for at least 3 three years, with SolarWinds exposure, now whether or not this exam/credential gains popularity is another story. Just remember this is centered around managing/monitoring a network, not how to troubleshoot and diagnose SolarWinds application/DB/Web issues. I will say the whole niche of network management (all aspects) is usually the most overlooked functionality of many networking departments. I would not mind seeing that change, just as I would not mind seeing this SolarWinds test gain in popularity and become a test that requires you to sit in a testing to take. It will be interesting to see where SolarWinds takes their certification surely they have potential to expand it to their other modules and even a ‘design’ designation due to how the architecture can change when you start involving EoC and splitting up modules/roles but time will tell.